Murmur Aeron01974 821692work Self-cateringMurmur Aeron is situated near the banks of the river Aeron in the heart of the Aeron Valley in Mid Wales ideally positioned between Cardigan Bay and the Cambrian Mountains. The property offers very comfortable & spacious holiday accommodation for up to 6 guests. Surrounded by farm pasture land and rolling hills, with scenic views from all the rooms. Home comforts include a large kitchen and separate dining room, a living room with multi-fuel stove, and a reading room. It also has a garage available for the use of guests and ample off street parking. Murmur Aeron also has a separate drying room just in case its been a rainy day. TV, DVD and CD players and a pay phone. Wifi internet access is included. A travel cot, highchair and baby bath are available free on request. Also ideal for bird watching holidays Murmur Aeron is only a short distance from Cors Caron national wildlife reserve and Denmark Farm conservation centre and well-positioned for visiting other nature reserves, Ynys Hir and the Dyfi Osprey project are only an hour away. 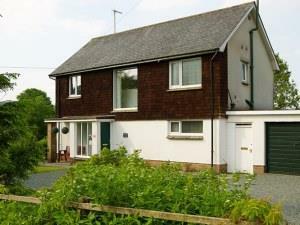 Sited near Llangeitho village where there is a shop/cafe and pub within walking distance of the house. Tregaron is 5 miles away, Lampeter 12 miles and Aberystwyth 18 miles. Murmur Aeron is available all year for weekly rentals and short breaks outside peak periods. We welcome children at Murmur Aeron, with games and books for rainy days and information on child friendly local attractions. Murmur Aeron also has a private garden. Murmur Aeron is a detached house with open views over pasture land near the river Aeron, there are nature reserves nearby and local scenic walks. Local produce can be purchased nearby from organic shops and farms. Murmur Aeron sleeps 6 in four bedrooms with plenty of space for small groups and get togethers including a separate dining room and a reading room. There is plenty of parking with garage and private garden. Only a short walk to local village pub and cafe. Spacious detached cottage with large garden, plenty of parking and garage. Murmur Aeron is situated near the banks of the river Aeron in the heart of the Aeron Valley in Mid Wales ideally positioned between Cardigan Bay and the Cambrian Mountains.